A talk on Guinness advertising history, Tuesday, 4th March. "I am writing to you on behalf of the St Bride Library as we are holding a talk next Tuesday, 4 March that I think may be of interest to you. I was wondering if you'd be able to post details of this on your blog if you think it would be appropriate? It's a talk being given by ex-Guinness brewer David Hughes on the lost Guinness artwork painted by Gilroy who is famous for painting their iconic advertising imagery from the 1930s–1960s. In 1971 all the original paintings belonging to S H Benson (who commissioned the work), once the biggest advertising agency in the world, was lost. Some 40 years later, it is starting to be sold off in the USA through the antiques market. So far over 320 canvases have been found; prior to this Gilroy oils for Guinness were rare and only found in archives. David Hughes wrote Gilroy was good for Guinness to showcase the lost art, much of which is never previously seen work from rejected campaigns; some outstanding images have come to light. Prior to this find, it was not understood that oil paintings were the final printers’ proof before a poster was made. Also on the evening, David is bringing Edward Guinness as his guest to the talk, who's knowledge into his family's history will be a valuable insight and a privilege to hear from. Your help in spreading the word would be much appreciated. @RecentlyDrunk @TheBeerFather What's happening? Barley Wine! Molson Coors have spent a lot of money on the Worthington's microbrewery. And they've hired a former brewer of the year to run it. But I can't say I've noticed anything exciting coming out of their fermenting vessels. Surely with all the historical logs to plunder and the crazy world of craft innovation there should be a steady stream of drinking delights pouring out of Burton-upon-Trent. Anyone know what's going on? 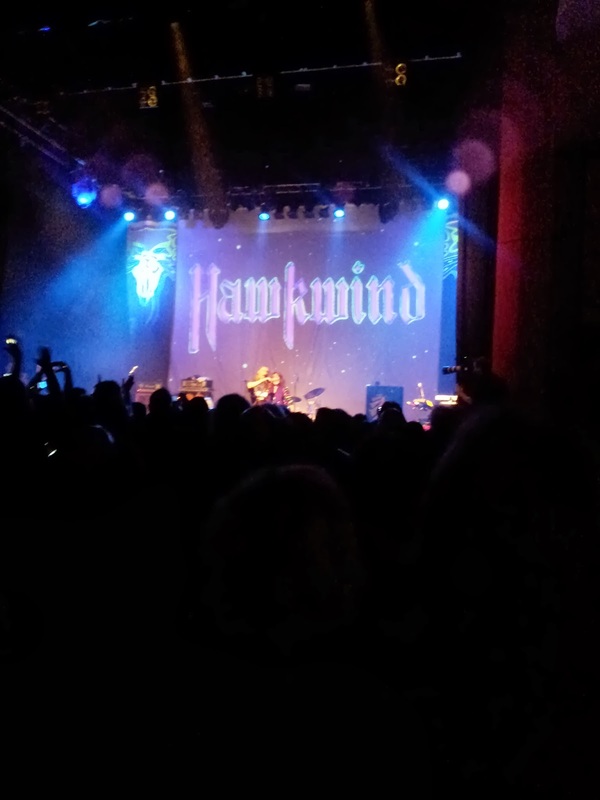 As I'm sure you're all aware there was a momentous event in London yesterday: Hawkwind were performing Space Ritual . Over the years I have pretty much seen all the bands I've ever wanted to see, but I did have a slight regret that I was too young to have seen Hawkwind on the Space Ritual tour. It was recorded for what is without doubt the finest album ever made, particularly as it now comes with the Roadhawks version of You shouldn't do that. The show was in aid of animal charities so I was slightly concerned we'd be harangued by hectoring herbivores throughout the evening but a well timed arrival and toilet break meant I managed to miss most of that. Hawkwind were supporting themselves so we were treated to a first set which included a lot of stuff from the Astounding Sounds era before the main event. At soon after 9pm the band returned and as promised played the entirety of Space Ritual, even including the poetry. I suppose with Bob Calvert long dead, Lemmy not there, and Nik Turner still feuding with Dave Brock it wasn't quite up there with the original but they'd managed to get Brian Blessed to do Sonic Attack which was fun, and way better than the last time I saw them wheel out a celebrity guest when Sam Fox slaughtered Master of the Universe. We didn't get You shouldn't to that as an encore, instead they did Silver Machine which was quite fitting. It's a bit of a mystery why it never made the album, and it was its success as a single that paid for the Space Ritual tour in the first place. As to the liquid refreshements I was please to see that craft beer was on sale. Well, it was all on keg and the Guinness was £4.90 a pint so I'm pretty sure it was craft. I’ve found recently that in an amazing bit of serendipity two of my beer obsessions have been picked up by other people. Someone has popped up on Boak and Bailey’s blog talking about Colne Spring Ale, and unlike me they’ve actually managed to track down some records of the original. I hope more details are posted. Meanwhile over in Farnham it seems hops are retuning. It's people growing them in their gardens at the moment, and they’re growing First Gold rather than Whitebines, but it's very welcome all the same. They’re having a meeting next week I am to get to. It’ll be good to meet some fellow Farnham hop fans. Speaking of which it's Hawkwind on Saturday. Another obsession will be temporarily sated. The Today programme was blahing on about beer this morning. They started at Cameron's brewery but soon moved on. It seems the undeserving poor in the North East can still afford to drink beer when presumably they should be drinking cocoa or going to church or at the very least just stop making a nuisance of themselves. A load of statistics I'm rather sceptical about were wheeled out, and some guff about booze being too cheap. Now I'm sure there are people doing themselves harm with their drinking but I'm very dubious about the costs attached to it. Surely drinking yourself to an early grave will cost the NHS less than living till you're so old you're falling apart at the seams and require constant care? It would be nice if they got a real economist on instead of a moralising puritan when they wanted to talk about costs. And I have to say the people drinking a pint or six sounded a lot more fun than the anti-alcohol campaigner.